$19.00 "AK", Issue #1 (September- November 2009), Russian text, outstanding new quarterly resource for Russian speaking medal collectors and militaria buffs. 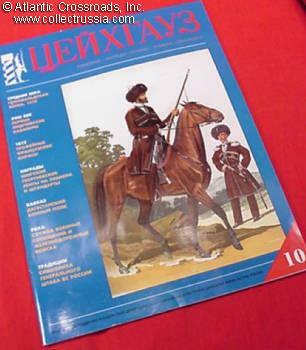 $19.00 "AK", Issue #3 (March - May 2010),Russian text, excellent quarterly publication focused on militaria. $19.00 "AK", Issue #4 (June - August 2010), Russian text, highest quality militaria magazine, published quarterly. $12.00 "Zeughaus" Issue #12, 2000. Russian text. $12.00 "Zeughaus" Issue #13, 2001. Russian text. $12.00 "Zeughaus" Issue #14, 2001. Russian text. $12.00 "Zeughaus" Issue #15, 2001. Russian text. $10.00 "Antiques and Collectibles". Issue #6 (8) June 2003. Selection of Imperial and Soviet items from Snuff-boxes to Soviet Propaganda of the Pre-WW2 Period. Highly interesting article on variations of the Order of the Red Banner of Labor. Very fine photography and information. Russian language text. $10.00 "Antiques and Collectibles". Issue #7-8 (9), July-August 2003. Russian text, 144 pp. Hallmarks on the flatware of the Khlebnikov Firm (excellent close-up photos). $10.00 "Antiques and Collectibles". Issue #10 (9), September 2003. Russian text, 144 pp. Soviet Order Badge of Honor - complete history with rare variations; breast badge of the Moscow Life Guard Regiment; mint errors and trial versions of Soviet jubilee coins. $10.00 "Antiques and Collectibles". Issue #10 (11), October 2003. Russian text, 144 pp. $10.00 "Antiques and Collectibles". Issue #11 (12), November 2003. Russian text, soft cover, 144 pp. $10.00 "Antiques and Collectibles". Issue #12 (13), December 2003. Russian text, 144 pp. $10.00 "Antiques and Collectibles". Issue #1-2 (14), January -February 2004. Russian text, 144 pp. The premier magazine for Russian collectors. $10.00 "Antiques and Collectibles". Issue #3 (15), March 2004. Russian text, 144 pp. The premier magazine for Russian collectors. Faberge eggs from the Forbes collection; Russian award weapons; breast badges of Imperial Russian charitable organizations. $10.00 "Antiques and Collectibles". Issue #4 (16), April 2004. Russian text, 144 pp. The premier magazine for Russian collectors. $10.00 "Antiques and Collectibles". Issue #5 (17), May 2004. Russian text, 144 pp. Detailed analysis of current market of Russian coins and its investment potential; Examples of antiques currently offered for sale by St. Petersburg stores and art galleries; Soviet invitation cards and passes. $10.00 "Antiques and Collectibles". Issue #6 (18), June 2004. Russian text, 144 pp. Summer 2004 exhibition of Russian awards in Moscow Kremlin; official suppliers of award watches to Russian Imperial Army; heraldry of Russia in bead motifs; jettons of Russian Imperial Army (7-page article with excellent, previously unpublished photos; antique coin market in Moscow. $10.00 "Antiques and Collectibles". Issue #7-8 (19) July - August 2004. Russian text, 144 pp. "Kremlin" service by the Imperial Porcelain Manufacturer; detecting the signs of restoration in old paintings; commemorative medals and jettons of the Moscow Industrial and Agricultural Exhibition in 1882. $10.00 "Antiques and Collectibles" Issue #9(20), September 2004. Russian text, soft cover, 144 pp. Includes badges of the Russian Priory of the Order of St. John of Jerusalem. $10.00 "Antiques and Collectibles" Issue #11(22), November 2004. Russian text, soft cover, 144 pp. $10.00 "Antiques and Collectibles" Issue #12(23), December 2004. Russian text, soft cover, 144 pp. Including German WW2 decorations for "Eastern Nations"